Scheduling issues – I hear you there, brother – pushed last week’s episode of Hit Me with Your Best Shot at The Film Experience back by six days, and that is where we presently find ourselves. 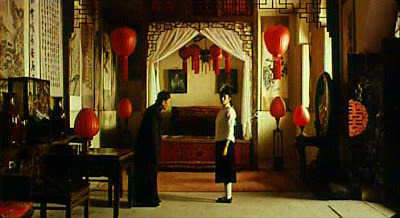 The assignment: select one single image from Zhang Yimou’s Raise the Red Lantern. Which is patently insane, because as anyone whose familiarity with Zhang extends solely as far as his wuxia Hero and House of Flying Daggers is aware, the man knows a thing or two-dozen about making with the pretty visuals. Raise the Red Lantern, while not as poppy and stylish as the director’s better-known later work, is a great deal more complex in its visual language and use of color. It is a powerfully rectangular work, with geometric arrangements of people and objects in the frame that recalls late Fritz Lang or Mizoguchi Kenji; the palette darts from ice-cold blues to sweaty yellows, with harsh gray mornings and rich orange afternoons for flavor. And of course the title itself primes us to expect red to be a dominating motif both thematically and within the story, which is all about using color as a flag: the film takes place in the huge estate of a rich man with four wives, each of them living in a quarter the size of a village square; the red lanterns are raised throughout the alleys of the quarter where the master is spending that particular night. So, point being: a dense, challenging entry, because nearly every single shot is assembled with such care that you could write a monograph on it. As is my custom when dealing with a movie that has almost too many options for a defensible Best Shot to know where to begin, I’m favoring something that comes near the start: the fourth wife, Songlian (Gong Li), has just been inducted into this odd culture, soaked in tradition and lanced with mean little jealousies and political games. I will confess: sometimes, my picks in this series are meant to be cunning, and sometimes they are really obvious. This one is obvious – maybe not isolated, but certainly by the time it rolls around, 6m50s into the movie (by which point I’d already noted three other candidates – there are seriously that many potential images from this movie), we know exactly what’s happening: this young, well-educated woman, already finds herself trapped by the precise lines and shapes of a world that is defined by its adherence to rituals that exist solely because in that family, they always have. The geometry of this shot isn’t as exagerrated as in some of them, but surely you can see what I mean by calling this a “rectangular” movie? And that overwhelming feeling of lines and right angles is how Zhang and cinematographers Yung Lun and Zhao Fei use the film frame to lock her in. Meanwhile, the red lanterns, which first appear in this shot, are the movie’s most obvious physical manifestation of the arbitrary and cruel family traditions that make up Songlian’s new cage, and even in this first moment, the chilly precision with which they are arranged all around her gives them a sense of authoritarian implacability. This is not the first and not the last shot that implies that this world is a prison, but it is, as the series has it, my pick for the best.